Infant sun protection clothing when outdoors in the sunshine for hours on end may be a necessary backup to the use of sunscreen alone, as it can sometimes not be sufficient for your young children. One of the really hard things to do with your toddler, is to persuade them to wear a hat. The variety of hats being made these days with added UV protection is large and so it's that much easier to find a hat that meets their approval. Best is when they love it so much they don't eat tp take it off. 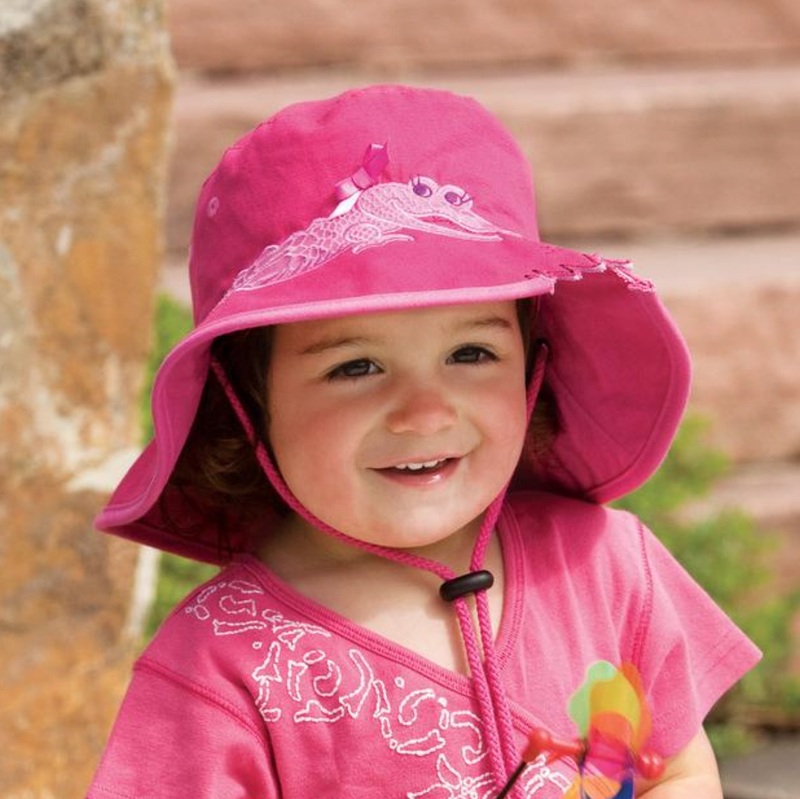 If you're clever enough, developing the habit with your toddler of wearing a hat whenever outdoors will become a lifelong habit for which they will thank you! There are so many options besides a hat though, of specific clothing for infants containing extra protection from the sun's UV rays. Kid sun protection clothing or swimwear (or sometimes called SPF Clothing or Sunscreen Clothing) started becoming well known around 1995, originating from Australia where the sun is embraced by a nation of outdoor enthusiasts. The focus on the risks of too much sun exposure has been hugely important in Australia, most especially where infants are concerned. Subsequently the Australian UPF products have become well renowned for both quality and durability. Ultraviolet Protection Factor (UPF) is a rating system used for sun protection clothing. It indicates how effectively fabrics shield skin from ultraviolet (UV) rays. The higher the UPF number, the greater the degree of UV protection a garment will provide. It is similar to SPF (Sun Protection Factor), the rating system known globally for sunscreen products, which measures the strength of protection a sunscreen provides against UVB rays only. UPF, however, gauges a fabric's effectiveness against both UVA and UVB light. More and more sunscreens include ingredients to provide a broad spectrum protection (ie. 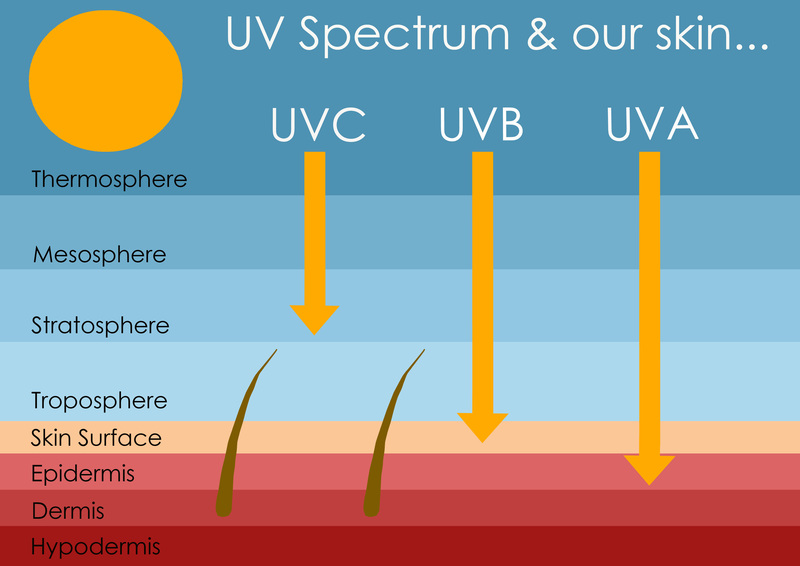 protection from both UVA and UVB rays), but no single method of measuring the UVA protection has yet been agreed on globally. Through the development of these high-tech fabrics, that have evolved over the last 10 or more years, we now have a huge variety available, designed to deliver 50 UPF+. This effectively provides us with 98% blockage from the UV rays, while also keeping us cool, comfortable and even fun and fashionable. Competing brands are forever improving this technology too, through the creation of innovative new fabrics and the use of proprietary processes for multi-stage testing. Examples of such testing is when each fabric is washed at least 40 times while also being subjected to over 100 hours of UVA/UVB rays. 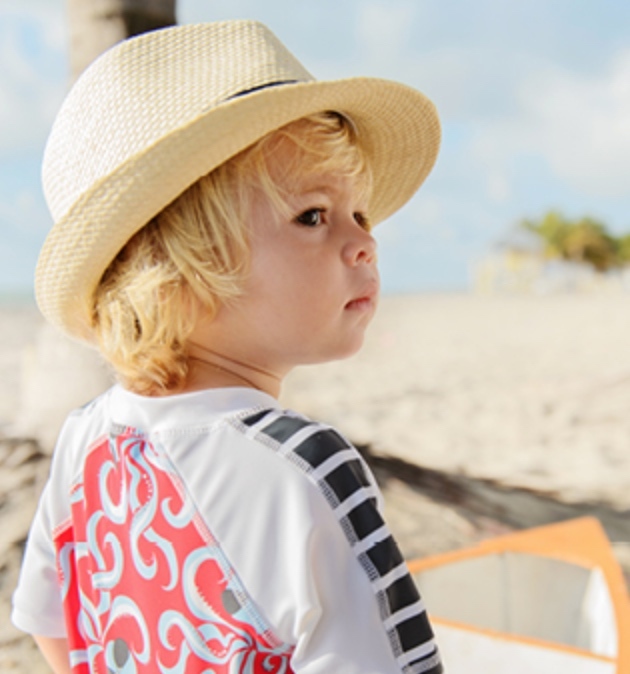 UV sun protective clothing comes in all different formats, covering all ages from babies to adults, with all sizes from newborn to extreme outsizes! But one of the first items that led the way, certainly from a popularity perspective, were swimsuits for infants. Besides UV sun protective swimsuits, there are other infant sun protection clothing items like sun protection hats and even protective blankets. Mostly offering at least a UPF 50+ rating, they block 98% of the broad spectrum of both the sun's UVA & UVB rays. From a broad spectrum point of view, this high coverage is actually hard to match where sunscreens are concerned and even more so if you especially choose a sunscreen without any toxic chemicals. Traditionally, sunscreens have been manufactured to provide more protection against UVB rays than UVA rays. Today this is rapidly changing as people become aware that in fact, the UVA rays, being the longer rays, penetrate deeper into the skin and therefore cause just as much harm, if not more harm, than UVB rays. Sunscreen usage also requires that you apply it to your infant diligently each and every time you go outside and again if it should be wiped or washed off for any reason. It's actually quite easy to forget or if remembered, to miss areas like the ears, back of the neck, feet or backs of the hands. Use of sun protection clothing for infants can complement the use of sunscreens and help you to relax more and have some fun in the sun. You can't really go wrong with the whole offering: a sun hat, a UV bathing swimsuit, a full sun suit, sun clothing and even a swim diaper! Many people believe that ordinary clothing is just as good as extra uv protected clothing as they don't get burnt. However, some regular clothing may only rate as low as UPF 5, which really does not provide any protection from the sun's UV rays. In comparison, UPF 50+ blocks 98% of the sun's UV radiation, and this level is what most certified sun protection clothing companies attain. One of the most precious moments to share with your child is their joyful experience of water, especially if outdoors - at the beach, swimming pool, lake, or even just a paddling pool at home. You may enjoy having fun in the sun but without adequate protection, the UV radiation can be hugely damaging to their skin. While still infants, over exposing them to the sun's ultraviolet radiation can cause long lasting damage, besides an uncomfortably painful sunburn. So, choosing to protect your infant with sun protective clothing, or UPF clothing, in my opinion, is a really excellent choice.